Posted by On a recent trip down to Calgary (lots of wedding planning so lots of trips between Edmonton and Calgary since the bride and groom's parents live in different cities so there's gonna be a bit more Calgary restaurants reviews than the usual for the next little while), my cousin, his fiancée and I hit up Menyatai Japanese Ramen for lunch. Its Korean owned, and it's name Menyatai means kiosk or fast food. 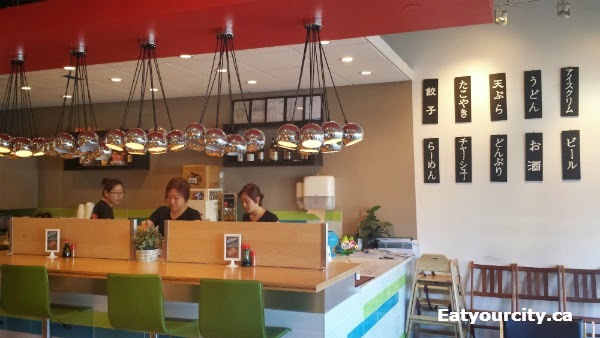 Since ramen is the quintessential fast food as in quick (not grease and calorie laden as it means in North America) in Japan and Korea, its aptly named as service is friendly and super fast! The space is bright and contemporary with a small seating bar surrounding an open kitchen and seating all around it bathed in sunlight streaming in from the large windows up front. We we the first to arrive when it opened Sunday morning, and the place filled up quick! Couples and families with little kids alike dug into udon and ramen bowls. Service was lightning quick and, well, lets get onto the food! 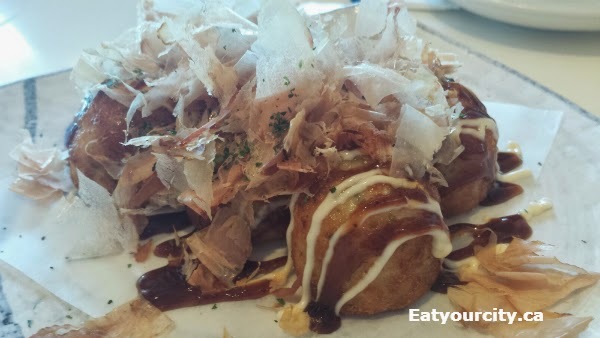 We wanted to save room for our ramen, so we ordered only one order of the takoyaki to share. These lightly fried ball of batter with octopus was probably the best takoyaki I've eaten in Canada. The exterior was a thin crisp layer, the interior a soft silky luscious savory goo with a good piece of tender octopus within. Drizzled Japanese BBQ sauce and mayo add in richness, sweetness and smokiness, and a huge pile of bonito flakes - smoked, dried and paper thin shaved fish, waves and "dances" as it hits the sauce and rehydrates, adding in a subtle unami smokiness as well as a visual element to the dish. A sprinke of furikake completes it, adding in a spot of green vibrancy and flavor with this dried fish and nori based seasoning. NOM! They have udon too, which I'll have to try next time, but we're here for ramen! I went with the Tonkatsu Ramen. The pork broth, while opaque from the pork bones used to make the stock, was not as rich in depth as I had hoped for. The chef skims off almost all of the fat (making for a healthier dish), but unfortuantly also removes a lot of the rich fatty creamy flavor one usually associates with Tonkatsu broth. The soft boiled egg was done to the perfect runniness - not overcooked or under. We joked it must have taken a lot of eggs to figure out the perfect timing to execute the perfect soft boiled egg. The Tonkatsu Ramen was quite tasty. The noodles were a perfect al dente, the char-siu pork thoughtfully grilled after slicing to give it an extra hit of grill-smokey flavor. And there was a good amount of green onions, pickled pink ginger, bean sprouts, and corn which added in nice textures and pops of right flavor with every bite. My cousin's fiancée went with the Spicy Tonkatsu Ramen which was the same as the regular Tonkatsu Ramen, with the Tonkatsu broth spiced up with mild specks of floating red chili oil that gave the broth a faint orange-red hue. 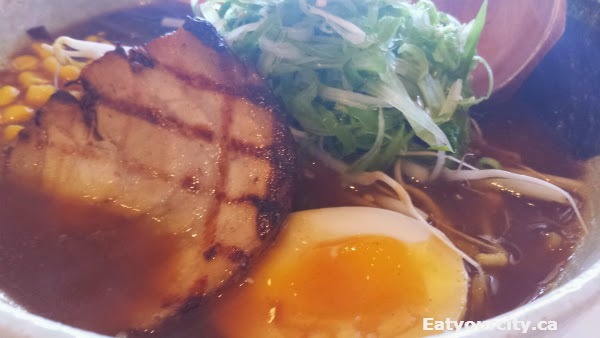 We found this broth richer than the regular Tonkatsu broth as well. Not sure why the pics of the broth look so different - same bowl, no filter. Oh well, its still Yum! My cousin went with the Curry Ramen. The broth tasted of the Tonkatsu base, with the addition of curry powder. Hints of tumeric and cumin shine through and oddly enough, it works and its like digging into a bowl of curry, but instead of rice, its a curry noodle bowl! Nom! Toppings for all the ramen bowls were the same: corn niblets, soft boiled egg, a slice of char-sui, shaved green onions, +/- pickled ginger, a piece of roasted nori. You can request more or remove topping ingredients if you like. Too full for dessert, we waddled out after lunch, making room for a line up of folks waiting to eat tasty ramen bowls of ramen. We gave the thumbs up to an adorable toddler was having a blast fishing out ramen noodles (sans soup) with her bare hands and stuffing her face... sometimes she missed and tried to stick the noodles in her ear/hair/lap lol! 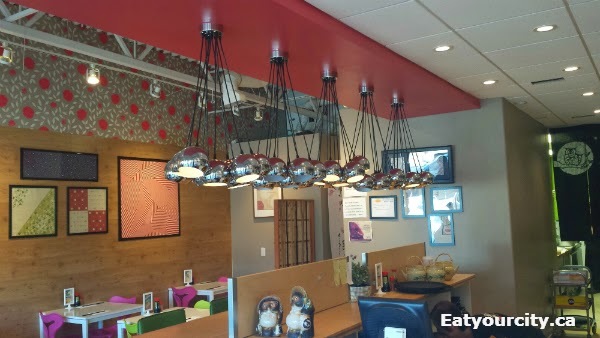 Next time, totally trying out their udon... or their cold noodle as its almost summer!